The M-22 Byway begins on M-22 on the east side of Leelanau County at the Traverse City/Elmwood Township boundary and traverses north along Grand Traverse Bay/Lake Michigan to the Village of Northport, then down the west side of the County turning off on M-109 in Glen Arbor through Sleeping Bear Dunes National Lakeshore, then back to M-22 through Empire into Benzie County. The Byway also includes the Leelanau County connector, which is an east-west road M-204 that runs across the center of the County and crosses over Lake Leelanau at the Narrows. In Benzie County, M-22 traverses through the Sleeping Bear Dunes National Lakeshore, the Frankfort/Elberta area, and the Herring Lakes south to the Manistee County boundary. 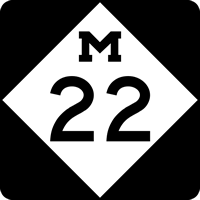 M-22 in Manistee County passes through agricultural lands and Onekama/Portage Lake area.